Cheers to propagating ancient traditions of unknown origins and modern tax exploitation! Great news Ian!! Congrats to the both of you. Excellent idea and execution on the band (extra points there)! Congrats man! I like the fact you made the band yourself. Not many people can or have the means to do that. I think it's pretty freak'in cool. Did the same a few years ago myself. Got one of them rocks, those ah...Hearts On fire diamonds, that's what it was. She loved it. Still loves it. Congrats Ian! Be sure to post up a picture of the wedding ring she makes for you. And relax. After one more round of polishing, the hardest part of the whole marriage thing will be behind you. Oh yeah, in case you didn't know, you have to buy her yet ANOTHER ring for the wedding. I know, right? I was like, "What? I just spent thousands of dollars on this ring, and now I have to buy another one!?" Seriously, I honestly did not know. Nobody told me. congrats man! best of luck on your journey together! hope she appreciates the work that went into that ring. means much more than anything store bought. Congratulations and I too like the idea of making a ring. As Jcobey says it means more. It's like the difference between a shop bought greetings card and a home made one one where you think up the words. Beautiful, distinctive ring! And congratulations on your engagement. In 1981, I alloyed my own gold and lost-wax cast my wife's wedding ring (I can't wear gold or silver due to skin sensitivity but am not sure about titanium or platinum). I machined the wax with a cutting bit I ground myself into what could be described as a ball-bearing race which smoothed edges so as not to cut delicate skin. Congrats on the engagement. Very nice ring. I really wanted to make my rings but time just didnt allow. Depends on the ring and the girl. Congrats man! Just as long as you didn't make the same mistake I did. Sold my first Hawk to buy a ring. Took several years before I could get another Hawk and she ran off before the big day. 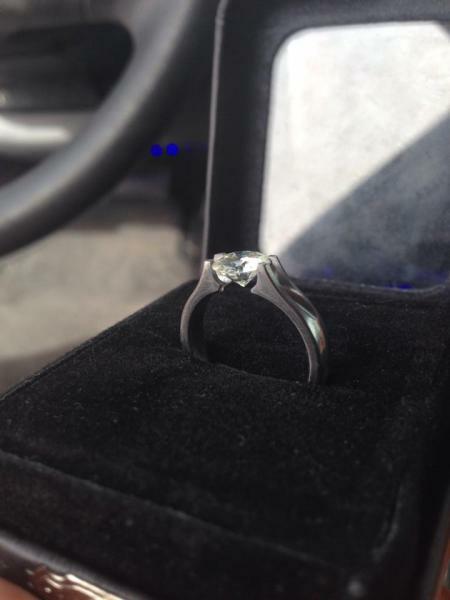 That is awesome you made the ring yourself! Wow that's a rough start, but sounds like you dodged a bullet and have a hawk again! It should be able to go 1/2 size up? It's already crazy how much her hands change during different altitudes, temps, and times of the day. In looking for ways to make it, I highly considered the loss wax method. That looked really fun to try, but I decided to take advantage of my access to a great machinist and his tools. Well, I know her size, so I'm planning on just making another one . Uh, I never said I gave the ring to a girl. Fortunately she happily goes along with all of my pseudo philosophies and frugality. I have a hard time playing Disney movie while simultaneously supporting gender equality because they feel mutually exclusive most of the time. But she's having fun and likes sparkly things so I'm not taking myself too seriously, haha! Then it's soft stuff like throw pillows and picnics on grassy knolls, right? That about sums it up; but, throw pillows are the second hardest thing. Congrats, Ian! I would expect that the ring would reflect your unique talents. It's beautiful and again, a great reflection of your vision. May you step together into the glow of the future. Quick Reply: I'll never do it again!